Several days of unusually heavy rains have killed at least a dozen people in the country Peru. 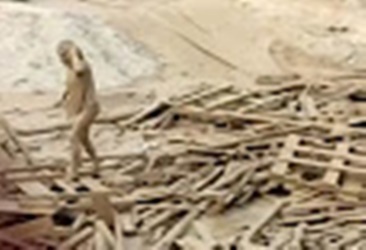 Watch the amazing moment a woman emerges from a deadly mudslide. Evangelina Chamorro Diaz is covered from head to toe in mud and luckily saved. 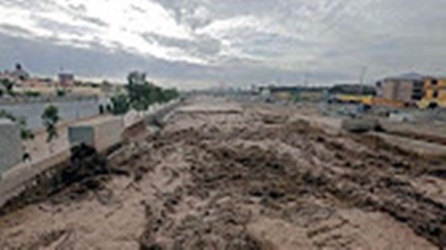 The new floods and mudslides over the past three days followed a series of other storms in Peru. Heavy rains have killed at least a dozen people in Peru and stranded dozens in the capital, who were saved. Cyclone Vardah has made a landfall in Tamil Nadu on Monday afternoon and it has made its landfall further in the coastal districts of Andhra Pradesh. The teams of National Disaster Response Force (NDRF) and Army are carrying out rescue and relief efforts in the cyclone-affected areas of Andhra Pradesh. Heavy rain and strong winds are lashing the coast in Tamil Nadu and neighbour Andhra Pradesh due to Cyclone Vardha. Watch aftermath activities that took place after earthquake in New Zealand. Typhoon Chaba caused heavy flooding and widespread damage hitting the southern South Korean city of Ulsan on Wednesday. As Typhoon Megi has started battering parts of China, precautionary measures have been taken by local governments in coastal areas of east China’s Fujian Province . A large typhoon with strong winds crossed over Taiwan killing at least four people and injuring more than 200 people. Due to heavy rains and impact of floods, the Gandak river in Bihar has changed the direction and due to soil erosion and flood waves, a Kisan and Panchayat building at Gopal Gunj has collapsed and within 8 to 10 seconds, the debris got mixed with flood water. A bridge in Xiushui County, East China’s Jiangxi Province, has collapsed all of a sudden Sunday evening.There are reports of three being killed and injuring another two . A biker is seen being washed away into the river, while trying to cross the flooded bridge in Hyderabad.This dramatic video went viral. Due to heavy rain in Hyderabad, low lying areas are inundated with rain water. Traffic has been disrupted and the motor vehicles were found stuck in rain water. The two Telugu states of Andhra Pradesh and Telangana are experiencing heavy rainfall. It has hit the normal life of people, paralysed the traffic and it went out of gear. Listen to the victims and watch the government measures. Watch the footage from traffic cameras showing the impact of Wednesday’s deadly earthquake in central Italy. Watch the 10-year-old girl , who was pulled from the rubble more than 17 hours after the earthquake in Italy. She is being taken to the hospital. Watch the footage of Drone showing the scenes of devastation with buildings reduced to rubble in the central Italian town. Bablu Martin, a social worker in Madhya Pradesh rescued a 12-year-old girl and also a boy.He died as he got trapped under a concrete beam. A three storeyed building of Housing board has collapsed. The collapse incident took place in Satna district of Madhya Pradesh . It is reportedly learnt that 25 people were buried and six were rescued. Hukou is the second largest waterfall in China. It’s volume of water increases every year, whenever the Yellow River is flooded. It is located at Shaanxi province in China. On Monday, the volume in the waterfall hit 4,400 cubic metres, a high for this season. According to the US state of Louisiana official reports, at least 7,000 people have been rescued after record flooding. In the video, a Bus is seen overloaded with passengers not only inside the Bus but also the passengers were seen sitting a top of the Bus. The Bus was seen stucking in a flood water.The Bus was seen swept away by flood water.